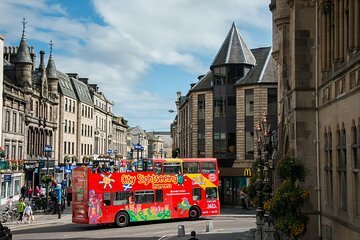 Erkunden Sie die historische Inverness am Ufer des schönen Flusses Ness bei dieser Hop-On-Hop-Off-Sightseeing-Tour. Erstellen Sie mit Ihrem 24-Stunden-Pass Ihr eigenes Abenteuer mit 11 möglichen Stopps, einschließlich Abertarff House, Caledonian Canal, Merkinch Nature Reserve und Inverness Castle. Während Sie mit einem Doppeldecker-Reisebus reisen, erfahren Sie von Ihrem erfahrenen Guide mehr über die Geschichte und Kultur der Stadt. Sehr gut organisiert, diese Tour. Wir hatten wirklich reichlich Gelegenheit, Inverness kennen zu lernen. Es wurden alle Sehenswürdigkeiten beschrieben, und dadurch, dass wir jederzeit aus- und wieder zusteigen konnten, wurde es niemals hektisch während dieser Tour. Der Busfahrer war sehr nett. Am besten hat uns die Natur rund um den River Ness und den Caledonian Canal gefallen. Given the small size of the city this is pretty much a waste! I did the Inverness Bike Tour which gave a much better overview of the city. Skip it! I enjoyed these hop-on-hop-off bus tickets! One thing that must be recognized is that the busses have routes that they take. You need to have a map of those easily available at the bus booths, and be aware that if you want to go south and the bus route is headed north, you will need to stay on the bus until it takes you in the direction you want. Most busses are narrated live or via audio they provide free earphone jacks in little sealed packets. After walking everywhere, these bus rides/tours are wonderful for touring the area in comfort. The upper deck allows for great picture-taking in good weather, too. When you want to get off, they have buttons to push to tell the driver you want to get off. They stop at all the stopping places anyway, but pushing the button will give you time to get downstairs. I highly recommend the HOPO Tour bus tickets if you are relying on public transportation or walking for your visit, and even as a first-time-around-the-city orientation tour. This is our second experience with this company. This one was again not up to expectations. The one bus ran only once every hour. We missed the first stop by just about a minute. We saw the bus as we departed a shuttle bus only to have to walk nearly a mile to get to another stop. The bus was extremely noisy, and we could not hear the narrative. This was by far the worst hop-on hop-off experience we have ever had. We have done many of them in our travels. Don't waste your time on this one. Far easier to just walk to sites within the city. I love taking the HOHO for any city. This city is small and beautiful. Only one bus was running, so you must plan for the time if you are in a tight time frame. The driver was friendly, but the sights lacked interest. There was no available online map so you have to pick one up at the main stop. The bus engine was loud so it was difficult to hear the tour recording about the town. However, showing a ticket from a Jacobite tour does get you a discount. great way to see the city .....we always find a City Sight Seeing Tour!